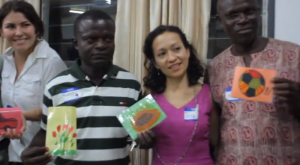 We had an incredible three-day professional development retreat in Ghana when we were there in January 2013. There were 50 special education unit school teachers of students with intellectual disabilities, 10 general education teachers, 8 dignitaries from the Division of Special Education in Ghana’s Ministry of Education, and the 27 of us in the Teachers College Columbia University speech-language pathology program. It is three minutes long. I hope you enjoy it!